CHICAGO, ILLINOIS, April 9th, 2019. 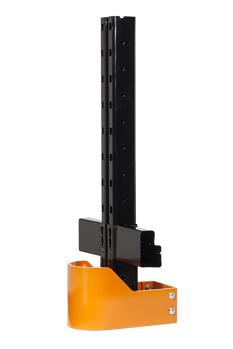 Damotech, North America’s most trusted pallet rack safety company, announced today at PROMAT 2019 the launch of two new rack protection products. These heavy-duty guarding solutions are part of an ongoing effort to expand Damotech’s rack protection line and offer its customers ever better products for preventing damage to racking systems and warehouse workers. The DAMO GUARDRAIL is a fence designed to be modular and offer reliable protection for warehouse walkways, building infrastructure or equipment. The DAMO BASE GUARD is an engineered rack column protector designed specifically to accommodate beams at floor level. Damotech’s new barrier is the evolution of an existing product that offers greater impact resistance than typical modular warehouse railings, while also being easy to install. 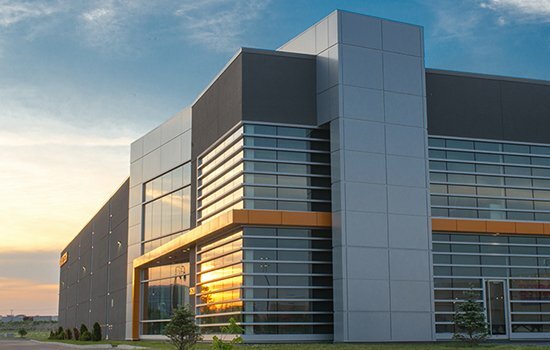 It won't bend like cold-formed steel or molded plastic horizontal barrier railings, which means pedestrians and warehouse workers are better protected. The DAMO GUARDRAIL is unique as it offers extra protection at floor level, along the entire length of the fence. 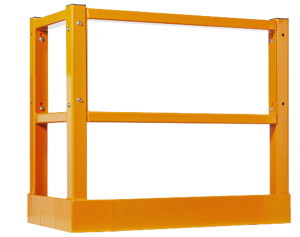 A 6” x 4” angle iron, which is anchored to the ground, prevents forklift blades and outriggers from reaching the protected area, making it safer than other guard rails on the market. Each vertical guard post has a welded front plate with steel tabs for optimal structural integrity. The posts accommodate any 90-degree configuration and come with pre-welded base plate protection. It’s easy to self-install in any pallet racking environment but can also be installed by Damotech’s certified installers. The DAMO GUARDRAIL has a standard height of 42" and is backed by a 10-year manufacturer’s defect warranty. The DAMO BASE GUARD protects the bottom portion of your pallet racking columns from forklift damage. It is unique in that it effectively protects the lower part of your upright while maintaining the ability to install beams close to floor level. Most pallet post guards will prevent beam installation at floor level because the guards cover the front column’s holes where beam connectors are generally attached. The DAMO BASE GUARD is designed to be independent of the columns and does not touch the front of the column. It’s solidly anchored to the floor and is not attached to the racking system. At 7” in height, it has a low profile, thus allowing for low beam installation. The DAMO BASE GUARD can be installed at the base of almost any pallet rack system from any rack manufacturing company and accommodates column base plate sizes of up to 5-1/2" by 7-3/16." Damotech’s new post protector is extremely impact-resistant and quick to install by your maintenance crew or by Damotech’s certified installers. The DAMO BASE GUARD is also backed by a 10-year manufacturer’s defect warranty. Learn more about the DAMO GUARDRAIL or request a quote. Learn more about the DAMO BASE GUARD or request a quote. See all rack protection products from Damotech. Damotech is the largest and most trusted rack safety and repair company in North America. For 30 years, Damotech has been helping warehouse owners keep their warehouse environment safe by maintaining their rack’s structural integrity. Damotech’s rack repair and rack protection solutions are safe, cost-effective and less disruptive to install than alternative solutions, making them the preferred choice of business-minded warehouse operators and safety managers. Top brands like Amazon, Bridgestone, GM, UPS, Lowe’s, Target, Coca Cola, SuperValu, Pfizer, and others choose Damotech for rack repair and damage prevention. Damotech also performs rack conformity inspections, load capacity calculations, rack safety training and offers state-of-the-art rack inspection management software.